yarn Silk Merino by Over the Rainbow Yarns. I love the yarn but like many other bloggers, I don't think the skein was as long as advertised -- resulting in a shorter than I'd like Clapotis. Notes After a couple repeats I read a suggestion somewhere about purling the dropped stitches to avoid the need for all those stitch markers. Once I did this it moved a lot faster. I'm really happy with the way these stripes match. I wrote a bunch about how I did it here. When I first knit the sock it had a ridge along the joins between the 2 circs (the opposite of ladders -- it was from pulling too tightly). I had never had that happen on wool socks before and I wasn't sure if it would relax. But it did! If you look at the pic it's completely gone. Since I knit these toe-up I had to hem in the picots when they were done. My first try created too tight of a hem. I finally went with a Kitchnered hem. There's a great illustration in Montse Stanley's book on how to Kitchner a hem in place. It's similar to kitchnering garter stitch. 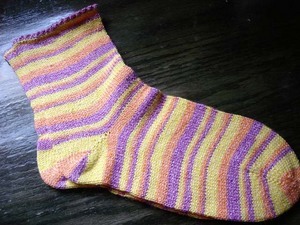 I was S-L-O-W but it worked -- took about 1.5 hours per sock! And it's as stretchy as the rest of the sock. I like the way this worked but I don't see many toe-up picot edged socks in my future. 3 hours on hems? Seriously.